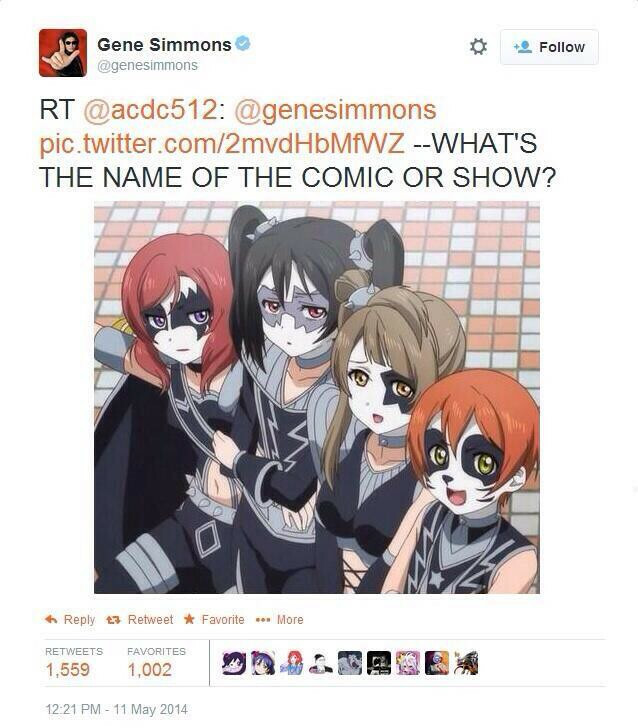 Via Crunchyroll, it seems that Gene Simmons of the obscure indie band KISS has discovered anime. Specifically, he discovered LoveLive!, which seems to be about high school girls forming a pop group to save their school from dissolution. The particular screenshot which piqued Monsieur Simmons’ curiosity was from an episode where the characters dress up as a certain group of white-faced leather queens. Of the anime I have nothing to say, as I’ve never seen it and I’m getting moe* vibes from the summary. I do find it hilarious that when Simmons asked Twitter where a screenshot of the anime was from, one smartass gave him the name of a pornographic direct to video series about underage male crossdressers. *Moe: slang term for a subgenre of anime and manga. I would define it as the fetishization of female helplessness, which is exactly as off-putting as it sounds.